Thanks to the internet and the advent of streaming video, politically minded people all over the world have the ability to watch this year’s conventions on dozens of sites. Practically every major news organization is hosting a stream, and those who aren’t are covering it live on their websites or on social media. But perhaps the most exciting — or, at least, unexpected — site to stream the conventions is Twitch, a site usually (almost) exclusively devoted to video-game streaming. We see this as a public service. It’s an opportunity for you to engage in the political process, and with each other, during this election year without leaving your native habitat, using the social and communication tools you know and love. I highly recommend watching the conventions on Twitch, exactly because of those lines about “your native habitat” and “the social and communication tools you know and love.” Twitch is, to put it mildly, a lively community, with unique customs and tropes, and a collective voice that make its chat section unlike any other — gleeful, cruel, hilarious, and impenetrable. The standard Twitch interface is simple: a real-time chat room for viewers, placed alongside whatever is is being streamed — usually a gaming session. The chat is fast and loose, often moving too fast for any one line to stay onscreen for more than two or three seconds, so the messages are short and rarely thoughtful. This high-velocity pace, the site’s focus on video games, and its relative age and quality as a streaming platform attract a web-savvy crowd that engages in what is known colloquially as “shitposting.” Shitposting is exactly what it sounds like: nigh-incomprehensible garbage published with reckless abandon. As a form of rhetoric, it is hugely appropriate for this particular convention. There is a cadence to a high-capacity Twitch chat room. There is an entire lexicon of Twitch terms and custom emoji that can seem impenetrable until you see it in action, in the cascade of words and images flying. People aren’t really talking to and about each other so much as yelling into the void. It’s a lot like a sports stadium, where individual people yell at athletes who can’t really hear them, but collectively form some sort of signal. 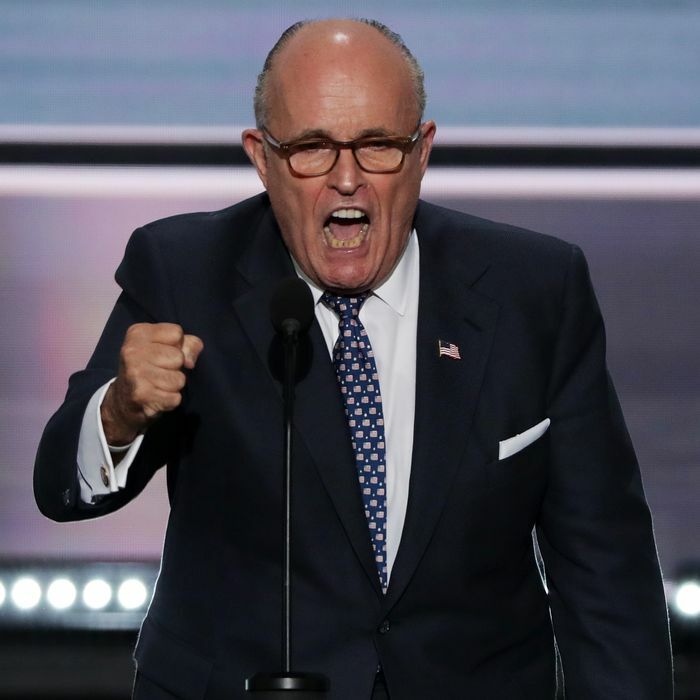 There is something distinctly amusing about referring to blustery gasbag Rudy Giuliani as “salty,” a fighting game term for upset or frustrated. As the convention adjourned last night, viewers started filling the chat with “GG,” the standard gamer parlance for “good game.” And, of course, the conversation can also veer into the adolescent and cringeworthy, as when chat participants started spamming “DEPORT” during Melania Trump’s speech. Streaming the RNC and DNC is the next logical step beyond successful experiments that have seen Twitch viewers rally behind otherwise mundane streams of Bob Ross painting tutorials and Julia Child’s The French Chef. The Twitch convention experiment serves a couple purposes. For one, it gets their community to pay attention to politics, even if marginally. But really, in streaming the conventions, Twitch isn’t forcing politics onto gamers — it’s forcing gamers into politics. Outside viewers will now have a taste of what the enormous and influential Twitch community is like — vibrant, expressive, sometimes problematic, and self-contained — by overlaying Twitch on conventional media. It’s tough to understand what a community is reacting to when you also don’t understand the game that they’re watching. By streaming the conventions, Twitch is hoping to take its parlance mainstream.